Studies show that dog owners are healthier than people without dogs. According to one, published in the epidemiology journal BMC Public Health, dog owners get an extra 22 minutes of physical activity a day. This means they clock in that 150 minutes of physical activity per week recommended for adults. That's a lot of benefit from simply walking your dog; imagine what you could do if you took things to the next level. 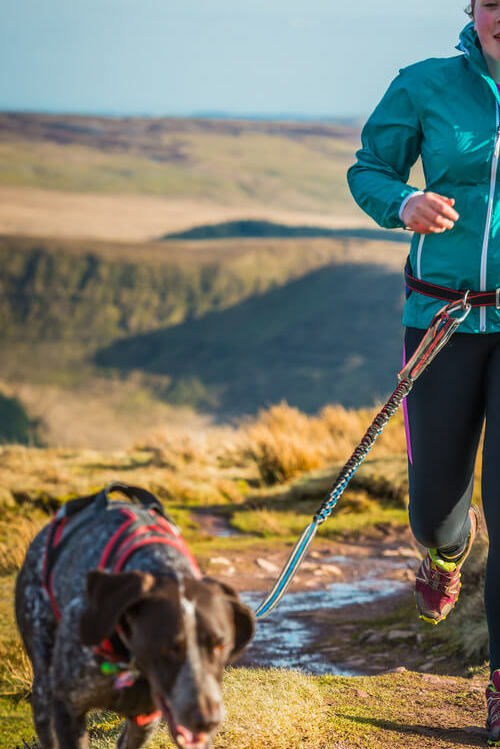 Seeing as the weather’s getting warmer we decided to help you do just that and scoured sports websites for workouts and activities you can do with your dog. Bikejoring is similar to canicross in a lot of ways. It is cycling while being pulled by your dog. The dog is wearing a harness that is attached to the main frame of your bike by a bungee line. The bungee line should be safely looped through a bikejoring attachment to avoid falling onto the wheel. Just like canicross, bikejoring has gained a lot of popularity over the last few years and there are groups and events you can join. If you're looking for bycicle insurance, check out our list of the 'Best bicycle insurance providers'. Furthermore, Bought By Many has negotiated a 10% discount with Bikmo for members for our cycling insurance group. It’s free to join. Cross country running with your dog is a really inexpensive and enjoyable way to get fit. Canicross is a mutual effort where the dog is wearing a harness that is attached to his or her human’s waist. The dog runs ahead, slightly pulling the owner and maintaining a constant distance. It's a pretty good way to channel a dog’s natural desire to pull, into an exercise where that’s not only acceptable but is even desirable. You will need to get a hands-free harshness for your dog with a waist belt for you. If your dog is not a natural at pulling, or has been trained not to, you might need to help it understand that it’s ok to pull while wearing a harness. If your dog is over 12 months old and registered with the Kennel Club, you can even enter canicross competitions together. It’s yoga with dogs! This is a great option for those in need of quiet exercise that promotes physical and mental health. It helps owners bond with their dogs while improving their muscle tonus and flexibility and relieving stress. In spite of some criticism, doga isn’t about making dogs meditate or do yoga poses, rather it is a workout that helps you spend time together and bond. Your dog will essentially be a companion who is in the room with you but doesn’t have to hit the matt with you. As you get calmer your dog is likely to follow suit and join you and lie on the matt next to you. You can also incorporate holding your dog into some positions or let it lie on your stomach when you’re on your back. Expert doga classes are now available in many yoga studios. A quick google search can help you find the nearest one to you. This one is more for the dog than for you, but that does not mean that owners and handlers don’t get to exercise. Flyball is a competitive dog sport where two teams of four dogs compete in parallel lanes, simultaneously. Each dog clears four hurdles, then triggers a pedal on what’s called the FlyBox. A tennis ball is released. The dog needs to catch it and make its way back to the start line so that the next dog can go. Humans help the dogs start their runs, guiding them and making sure the next dog gets to start only after the dog before it has finished its run and crossed the finish line. The winning team is the first one to finish all their runs successfully. As with canicross and bikejoring, there are many events and competitions you and your canine friend can join. Swimming with your dog can be a lot of fun for both of you. Make sure your dog is a good swimmer beforehand, not all dogs are. If your dog has shorter legs or is smaller you might want to watch it closely. If you decide to swim in the sea or the ocean, make sure there is no bad current. Most public pools don’t allow dogs, but a lot of them organise sessions for dog owners and their pets only. Holiday cottages increasingly cater to dog owners. Perhaps getting one with a pool on your next holiday could start off your canine-inspired water adventures! For extra safety, you might like to get your dog a life jacket, which will help it stay afloat even if it gets tired. If your dog has never swam before, ease into it. Make sure the water’s the right temperature, you don’t want it to get too cold and watch it closely to evaluate its swimming skills. Whichever sport you go for, always make sure your dog is healthy enough to participate in an activity beforehand. If you’re in doubt, it’s best to consult your vet before you embark upon your shared sports adventures together. Other than that, enjoy getting healthier and fitter together! We’d also love to hear about your favourite way to exercise with your dog, just drop us a line on Facebook to tell us (or show us).